It’s been a long, quiet year for Ronda Rousey, and for us. For several years there it felt like you couldn’t escape the women’s MMA pioneer. Everywhere you looked—in the cage, on TV talk shows, even in the movies—there she was: a one-woman ambassador for MMA, a promotional whirlwind, the sport’s first true crossover star, the Chosen One taking the much-maligned mainstream. Then, last November, she got knocked out by Holly Holm, losing her belt and her air of invincibility in the process, and it was like a light went out. Aside from the occasional confessional interview or Hollywood red-carpet appearance, Rousey maintained radio silence and retreated into something like normalcy for 365 full days. One doubted if we would ever see her again in the Octagon. First we mourned and eventually we adjusted to life in a post-Ronda, McGregor-dominated world. This morning, though, the old world seemed to snap back into place. 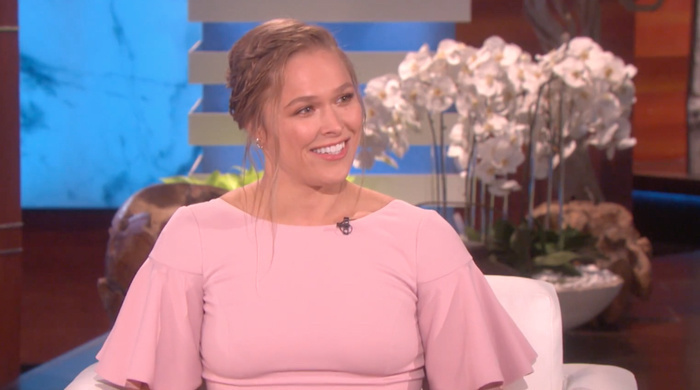 There was Rousey on the couch of her favorite daytime television show, The Ellen Degeneres Show, chatting away about her love life and her Hollywood knitting club (part of what the former champion calls her “apocalypse plan,” because if you can’t knit when the end of the world comes, “How are you going to get clothes?”), and her preparations for her long-awaited comeback fight against current women’s bantamweight champion, Amanda Nunes, at UFC 207 on Dec. 30, preparations that include climbing trees. Just your typical lighthearted early-morning talk-show banter between a stand-up comedian and a professional cage-fighter.